I’m a big fan of baingan (eggplant) and here’s a super easy baingan ka bhurta recipe that goes great with white rice, naan or with a piece of toast! Heat the oven at 350F. Place the eggplants on a baking sheet and put inside the oven for around 30 minutes. Rotate in between. Take the eggplants out and remove the skin. Place the insides in a bowl and smash well. Brown the onions in a pan with some oil. Add the chopped tomatoes and fry till it becomes a paste. Fry the cumin seeds and whole chili separately. Grind them to make a powder. Add to the tomato paste. Add salt and ground coriander and keep frying. Now add the eggplant and fry some more. In the end add some chopped cilantro and mix together. You can also add some green onions for garnish. You can eat this baingan ka bhurta (Eggplant mix) with white rice, naan or a piece of toast! I tried another variation of this recipe for a dinner today. Take some mini pitas and add baingain ka bhurta in the middle. Now place in the over at 300F for 10 minutes. Take out and garnish with green onions and chopped cilantro. Serve either with the main course or as an appetiser. 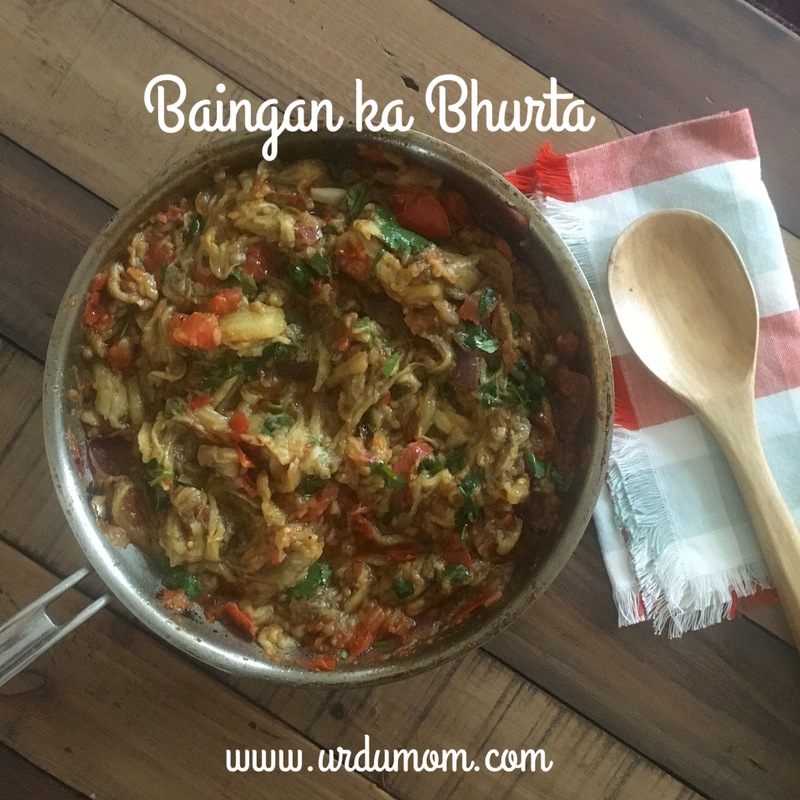 Let me know if you try this baingan ka bhurta recipe and how it turns out! My mother from Dera Ismail Khan adds little chopped florets of cauliflower and baby green peas in the fry mix tastes good. Also you can do the Baingan’s initial baking in a microwave a lot cleaner and easier to skin later). Don’t forget to make a cut in the top of the baingan before baking. I love eggplants. Will definitely try this recipe. When you say chillies, are you referring to green chillies? Thanks!